Congratulations to Tracey Evans, Shopping Spree Winner! The Sunsational Sidewalk Sale last weekend was a great success, with shoppers crawling all over Fenelon for the hot deals. To mark the event, the Events Committee very generously collected a package of gift certificates from participating stores and raffled off the grand prize of a $250 Shopping Spree. 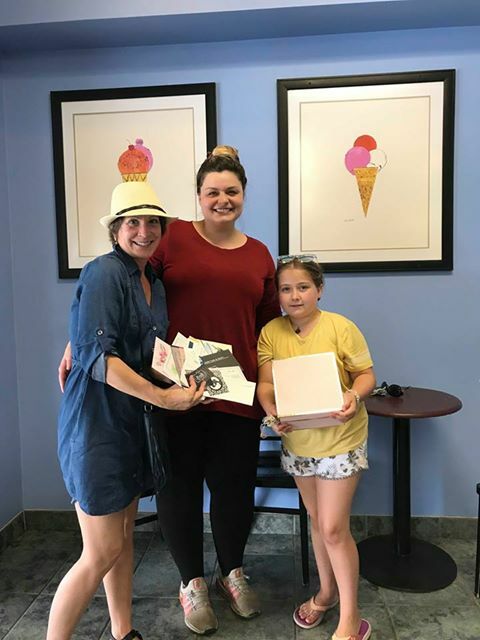 Left to right: Anna Radey, special events committee chair, shopping spree winner, Tracey Evans, and her daughter, Olivia. The winner, Bobcaygeon resident Tracey Evans, was delighted with the prize. Tracey says that she is "so grateful for the shopping spree in Fenelon Falls! It was a lovely afternoon with my daughter Olivia. We shopped throughout the local stores and appreciated breathing in the fresh air from the shores of your local lakes; Cameron and Sturgeon. We enjoyed the Splash Pad and sipped mint milkshakes and cherry yogurts throughout the afternoon. I have been battling cancer recently, and the afternoon out on the town was a perfect way for Olivia and I to spend the day together. Thank you Fenelon Falls, and thank you to the Chamber of Commerce Events Committee for organizing the sale." We are so glad to have such a warm and welcoming community that allows people to relax and reconnect. We look forward to seeing Tracey and Olivia again when they come back for their shopping spree, and wish Tracey all the best.